Bollywood’s King Khan Shah Rukh Khan has time and again given us some of the best romantic films. Which is why he is rightly called the ‘King of Romance’. But have you noticed; many of his films often have love triangles. Let’s take a look at 10 such films where SRK has had love triangles: Jab Tak Hai Jaan (2012): Legendary director Yash Chopra’s last film Jab Tak Hai Jaan showed a love triangle between Shah Rukh Khan, Katrina Kaif and Anushka Sharma. Shah Rukh Khan plays the role of an army officer and Anushka plays the role of a journalist. While Anushka falls in love with SRK, he is still haunted by the memories of Katrina Kaif. Kabhi Alvida Naa Kehna (2006): The new age film Kabhi Alvida Naa Kehna starring Shah Rukh Khan, Rani Mukerji, Abhishek Bachchan and Preity Zinta was a story about extramarital affairs. In the film SRK is married to Preity Zinta, but feels distanced from her. Fate brings SRK and Rani together who soon start developing a close bond. Kal Ho Naa Ho (2003): The super hit film Kal Ho Na Ho made us laugh, cry, and cry while laughing at the same time. Kal Ho Naa Ho saw SRK in the role of Aman who is a carefree guy putting a smile on everyone’s face wherever he goes. Preity Zinta is a very self-conscious lady who has lot of responsibilities on her shoulder. While Preity falls in love with SRK, SRK who has cancer, sets her up with Saif Ali Khan. Devdas (2002): The iconic Sanjay Leela Bhansali film Devdas saw SRK in a completely different avatar. In the first half of the film, SRK is the charming NRI guy who comes back to India. SRK and Aishwarya Rai Bachchan who were madly in love are broken apart due to their families differences. Later SRK who turns into a drunkard finds solace in arms of Madhuri Dixit, but Aishwarya still lives in his heart. So much for being filmy! 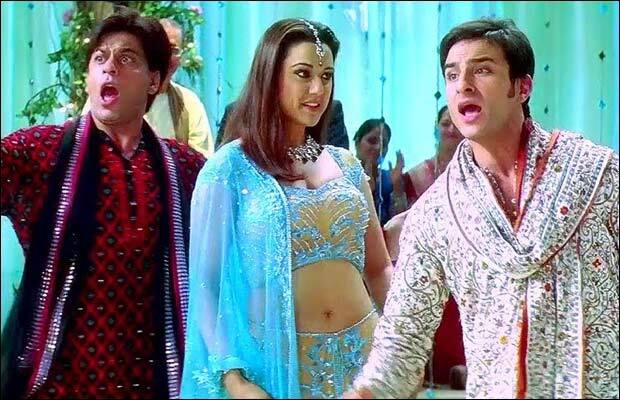 Kabhi Khushi Kabhie Gham (2001): Another one of Karan Johar’s gems is Kabhi Khushi Kabhie Gham where we saw a star studded cast of SRK, Kajol, Amitabh and Jaya Bachchan, Hrithik Roshan and Kareena Kapoor. In the beginning of the film we saw Rani Mukerji in a cameo role where she was getting engaged to SRK, but SRK was mad in love with Kajol. Kuch Kuch Hota Hai (1998): Well we’re sure Karan Johar has a thing for love triangles! Literally dozens of his films have love triangles in them, and the common factor is SRK. This epic 90s film has given us songs, jokes and emotional scenes to cherish for life. Well KKHH is more like a love square since first half of the film had a love triangle between Rani Mukerji, Kajol & SRK. While the second half saw SRK winning Kajol back who was engaged to Salman Khan at that time. 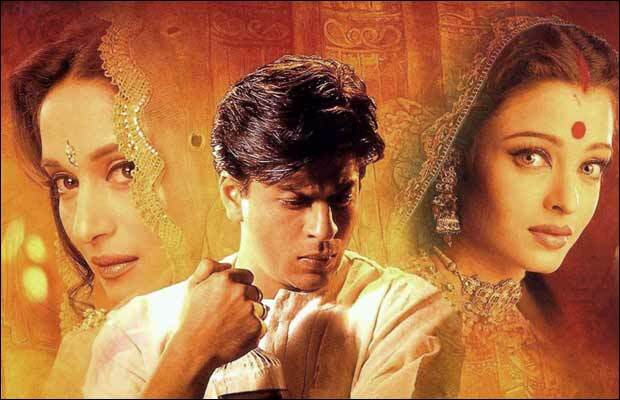 Dil Se (1998): Dil Se was one of Mani Ratnam classics where we saw Shah Rukh Khan with Preity Zinta and Manisha Koirala. Manisha played the role of a terrorist in the film that SRK falls madly in love with without knowing her true identity. Later he gets engaged to Preity Zinta in the film, but still secretly loves Koirala. Like come on Shah Rukh, make up your mind already! Dil To Pagal Hai (1997): Yash Chopra’s hit film Dil Toh Pagal Hai saw Shah Rukh Khan, Karisma Kapoor and Madhuri Dixit in the lead role. Now this one’s a little complicated. So SRK and Karisma were leaders of a dance troupe and Karisma was secretly in love with him. Madhuri Dixit enters their dance troupe and soon dazzles SRK with her amazing dancing skills. Madhuri was actually promised to Akshay Kumar, but by the end of the film, SRK gets Madhuri and Akshay gets Karisma. Too much Bollywood for one day! 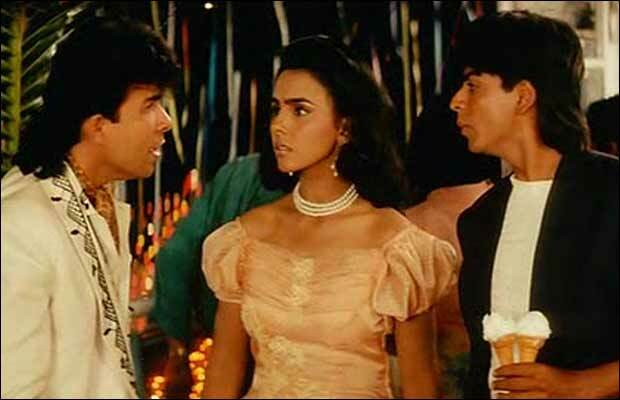 Kabhi Haan Kabhi Naa (1994): Kabhi Haan Kabhi Naa saw SRK as a middle class boy who joins a music group. He falls in love with the beautiful lead singer Suchitra Krishnamoorthi. But Suchitra is in love with Deepak Tijori. In the end SRK who has a huge heart reunites Suchitra with her lover, and sacrifices for the sake of their happiness. He later falls in love with Juhi Chawla, so no loss we guess? Darr (1993): This one’s a unique film by Yash Chopra where he convinced SRK to be the bad guy. The film sees an engaged couple, Juhi Chawla and Sunny Deol. The couple starts receiving death threats from Juhi’s obsessed lover, played by none other than Shah Rukh Khan! SRK’s role as a crazy-in-love psycho stalker is surely something we’re never going to see again. Nor do we want to! Previous articleShahid Kapoor And Mira To Plan Second Honeymoon Soon? Next articleWatch: Unseen Video Of Saif Ali Khan Kissing Kareena Kapoor!